We had mentioned some event would happen at the V&A in this month, and we can now give you more details about it. If you were familiar with the Friday Late events at the V&A, you might know that they take place every Friday from 18.30 to 22.00 and that it is FREE to attend. As it is first come, first served, once the museum reaches capacity, access is allowed on a one-on-one basis. The programme usually covers a wide range of activities including live performances, cutting-edge fashion, film, installations, debates, special guests and DJs, with bars, food, and late-night exhibition openings. 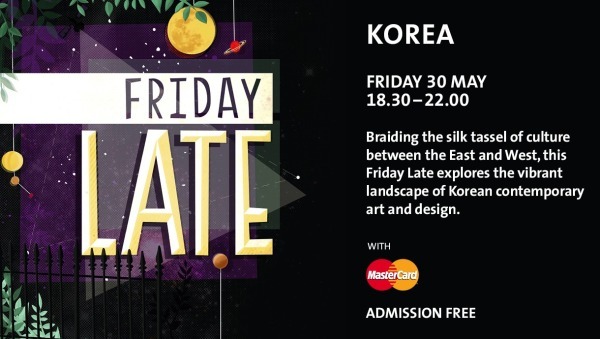 This time, on Friday May 30th, the Friday Late night event will be dedicated to South Korea! All forms of arts will be showcased, from pottery, sewing, poetry to gastronomy, music and design. An armchair made of rice straw by designer Kim Been on which to sit while wearing a Hanbok and a pair of Gomusins (provided). Finally, for those who missed director Yun Seokho (Winter Sonata, Autumn in My Heart, Spring Waltz) at SOAS and LSE, he will be giving a talk from 8.00pm about Korean love stories, the concept of skinship and the reasons why YSL’s Rouge Pur Couture No. 52 lipstick sold out worldwide. Of course, there will also be drinks, available in the Grand Entrance throughout the evening and in the John Madejski Garden (weather permitting). Food will additionally be served in the Cafe until 21.00. So if you do not want to be left out, book your evening and come early to the V&A. According to KpopTeam, 6,000 attendees are expected.